Could someone explain to me what party means.. why not it is affecting my backrow? is this a bug? need mod here.. please report this.. my back row is not affected by unbreakable bond when it says it should affect the whole party. I have reported this for you. t.y. as you can see from the encircled agility but only to show its not affecting my back row.. not only agility but HP, defense and attack also. That\'s why my back row is so weak than the front base on the attributes of Unbreakable bond B.R. Dear Player, nyx has reported this issue for you please do have patience. sept 24 I reported it.. its 28 now and not fix yet. Please follow up this moderator. Please wait a little bit, since gta dev is off in sat-sun. They will answer it at monday (HKT). Nyx will follow you up later. 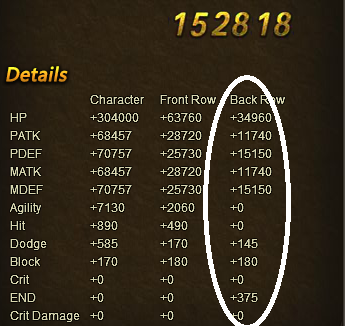 Dev fix the back row but now front row bonds doesn\'t affect anyone of my front row. My front now is so weak because;of this,;please follow up again.. moderator. please compare the first pics i uploaded w/ this one. 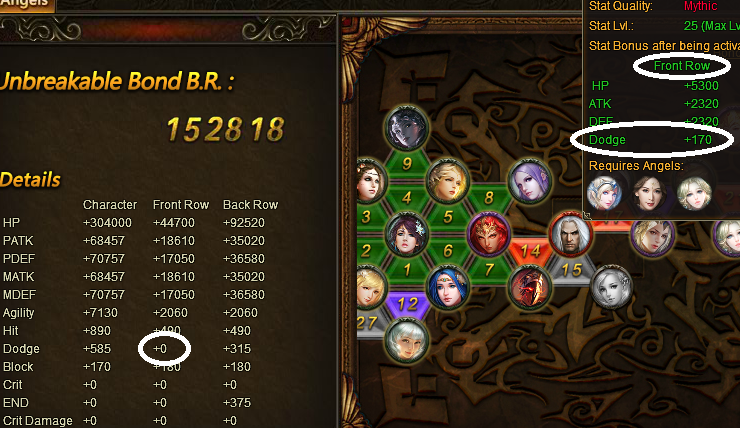 AGAIN party bonds;doesn\'t affect back row.. there must be something wrong w/ your update. Dont tell me every update goes back to this..
Its friday now... still not fixed. Moderator please follow up this problem. 2019-4-21 18:49 GMT+8 , Processed in 0.073237 second(s), 52 queries .